Parcours 2: A boot inspired by specialist knowledge of walking and the fruit of two years' research and development. Very comfortable boot with good grip on sole. Comfortable wellies. Hope they last! Very comfortable sizing seems accurate. Expensive!? My last pair lasted 3 years! Great product its my second time purchase although they only lasted just over 18 months I use them twice a day for dog walking and they coped with all weathers. 1st pair gave up by splitting near big toe joint. Usually wear a 6 and ordered 39 great fit very comfortable on my wide feet! Second pair of these boots didnt hesitate to buy another pair as very comfortable.Uttings online site easy and delivery very efficient. buy at a good price. This is my second pair of Aigle Parcours 2 willies. My legs are quite skinny so I decided to go for the model without the adjustable gusset down the side they fit well (better than the gusseted model for me) so good choice and saving for me. Comfort levels are outstanding my old Dunlop basic wellies were not in the same league. I just hope they last for more than a year before they spring a leak or the liner falls apart as they dont appear to have any guarantee. This is the 3rd pair Ive bought over the years. I used to buy Hunter boots but found they were wearing out really quickly. 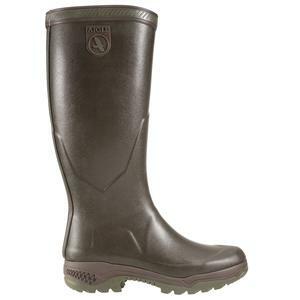 The Aigle boots are very comfortable and have a robust feel to them. Would highly recommend. The best make and value. Highly recommend. Wonderful boots for my wife. Great price and quality. I was very happy with the parcour wellingtons they were a gift and the recipient thinks they are fantastic. The price was good as was the service. Present for partner who loved them. Great pair of boots. Proper wellies that not only look good but are made for working in too. Incredibly comfortable and warm too! Already done so very good service. Good dog walking wellies after years of cheap ones though it was time to upgrade. Good decision! The best wellies I have found after using lots of others. These are a good long lasting Wellington I wear them at least twice a day every day for walking the Labradors. I walk on paths tarmac grass in all conditions. Comfy and light to wear they keep your feet warm as well. Had my last pair for 4 years before they split which was my fault as I had not looked after them. Great boots. Bought as a birthday present and he loves them! Great boots really comfortable this is my third pair. I can walk all day in them without any problem. These were the third pair of Aigle Parcours wellingtons my wife has bought. I dont think they last quite as long as they should but she wears them twice a day for at least an hour each time while she attends to her animals in all weathers and says they are the most comfortable boots she has ever had so wont look at anything else. She has tried quite a few and one particular make (rymes with Bunter) only lasted 5 minutes since they were bought by the Chinese and turned in to a fashion item. I have been buying these wellington boots for years. The last pair I bought did not live up to the quality to which I was used. Uttings dealt with my complaint very promptly and the boots were replaced without any fuss or argument. Great wellington boots. Very pleased. My wife has a history of destroying wellies thought we should go for something really tough these are fabulous. Very comfortable fit although I think they are on the large size. I bought size 5.5 which is normally good for me but have been wearing two pairs of socks which is fine for Winter but in Summer they may feel too big. Lovely boots very comfortable just bought them so dont know if they are long wearing yet. My second pair. They get a lot of use. Ive had leather lined and neoprene lined wellies over the years but none have been as good for walking as these. My tip buy them slightly large use insoles in the summer and thicker socks or two pairs in the winter. Comfy so far but a little tight on getting off. Really pleased with product. Good shape calf size perfect comfortable bought for walking on the moors. Look fashionable and stylish great brown colour. Intend to buy khaki green too. Great boots. Im replacing my last pair bought in 2001. The soft insole is a really nice addition. Heres to another 17 years of happy walking through mud and water with dry feet. These are the second pair of Aigle boots I have had from this vender. The boots are really comfortable the sole gives good grip and cushions your feet from stones. They are very pliable and great for walking in I use them all the time for walking my dog. The first pair I had were insulated very good in the cold but my feet overheated in Autum and Spring. Unfortunately they split after 3 1/2 years at the big toe joint although I did use them every day as above and didnt use any rubber conditioner on them see how long these last. Very comfortable although not the warmest I have ever had. I suggest the neoprene lining if this is what you want. But I wanted an all year round wellie as I spend most of my life in them. Im a 60 year old farmer with knackered knees and hips so the shock absorbing quality of these wellies are a welcome relief. Excellent boots worth the money! Bought these to replace previous pair that gave 5 years of good winter spring and autumn dog walking service (mainly on beaches) before they perished probably due to being left too close to radiators!These are comfortable straight out of the box. They are not as rigid or heavyweight as some other brands (some may not like the soft pure rubber) but the result is no painful rubbing on ankle bones etc. The soft rubber moulds well around the calf (those with large calfs might need to think about fit though as there is no adjustment) to give quite a slender profile. Good thick sole with plenty of grip but also flexible.Sizewise probably true to size with room for a decent pair of walking socks.Brown (dark) makes a nice change from black or green.If I get 5 years out of these Ill be happy keeping this pair away from radiators though! pleased with product. appears sturdy and has good tread..
Great wellington boots. Do their job perfectly in the stables and fields! So very comfortable great for walking the dog miles. However after 6 months they showed signs of splitting and started to leak where the foot bends. I expected them to last longer than this so I returned them and Uttings have replaced them. Lets hope these are ok. I have had several pairs of these boots as they are extremely comfortable. The only issue is that when I have worn them for a couple of hrs a day (when raining/wet) by the time they are 18 months 21 months they seem to perish where the toe bends. However the boots do have a two year warranty and I have had a couple of pairs replaced under warranty. Apart from that I am very Happy with the boots. Boots as described size is usually 10 but ordered 10.5 I have a narrow foot and high instep but no trouble getting these on room for 2 pairs of socks lovely boot very comfortable. My partner has had a different make by Aigle for 18 months and they are roomy even for wide feet very comfortable with no signs of wear. After taking receipt of these bootsmy use of the term fits like a glove has now been amended to fits like a Parcours! An extremely comfortable experience. Very comfortable and warm sturdy but not heavy as so many other wellington boots are these days. Super comfy and great grip. I have had to return these boots twice due to faults . Well made excellent grippy sole with deep tread. Ideal for country walks. Great dog walking boots comfortable and fairly long lasting for road use. Nice wellingtons though a bit tight around the calf if have bigger legs! The most comfortable gumboots ever! Great for walking not heavy or wide legged like neoprene lined styles. I have gradually bought pairs for all my family. Not cheap but absolutely worth it. Great fit and the advertised size can be relied upon. Very comfortable. If these last as long as the pair they have replaced I will have no complaints. Haven't had a chance to really wear them in yet. However, they seem comfortable and well made! I have a dog so wear wellingtons a lot! This is my second pair of Aigles (first pair lasted 10 years, the heel was very worn when they finally went in the bin). Lovely "squishy" sole, incredibly comfortable. Slim leg so not flapping around your calf like cheaper boots do. Def worth every penny. Uttings service superb. Ordered Monday morning. Arrived Tuesday morning. Was kept informed of delivery. If you only ever buy one pair of quality wellies, make it these. I have owned the Parcours for two years and found them to be comfortable for lengthy walks and sufficiently rugged. The only reason I did not rate them 10 out of 10 is because my previous pair of Aigle wellingtons (model name unknown) were like slippers, in fact I was concerned that they appeared so "delicate" that they may not last ------- they lasted an incredible 20 years of regular wet weather use. I seem to go through boots a rate of knots walking my dog just an hour a day. I had to return Hunter Snowboots for being incredibly uncomfortable and I have to say they are the best boots I have ever owned. (Hunter soles wear very quickly and my cheap end Le Chameau split in under a year, as did my Dublin ones).....3 months in and these are showing no sign of wear. They are really well made and I would say they are generously sized in the foot - average on the calf.